In our firm, you will meet a friendly, knowledgeable, and professional staff who will be able to fit your unique needs and exceed your expectations. The firm has a focus on individual income taxes and planning, businesses, investment partnerships, trusts, and estates. 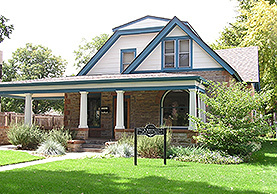 The office is located in the heart of Fort Collins between Colorado State University and the Old Town area, conveniently accessible at 515 South Howes Street. This office is housed in a charming and comfortable 1880′s era homestead. With a solid team of seasoned professionals, we are built on trust. When it comes to your money, and especially your taxes, trust is critical. You want to not only be confident that your Certified Public Accountant is knowledgeable, accurate, and prompt, but that they have your best interests in mind from the beginning and throughout the relationship. You want someone you can depend on and speaks in a language you can understand. It’s important to find an accountant that keeps your goals in mind, answers your questions, and is there when you need them. Our first priority has been, and always will be, you. We take pride in our commitment to you, our clients, and in meeting your individual needs. You are our first priority, and we go out of the way to present you with tax planning options that give you confidence in your tax situation. We believe in getting the work done quickly and efficiently, while helping you reduce your tax liability. We commit to using our knowledge to save your time and energy. We focus on providing a professional service that meets your needs through innovative thinking and efficient work. We know the tax code inside and out and we specialize in filing your income taxes error-free. As a trusted advisor, we are here to support you in every way possible, and we know how important it is to establish complete understanding of your financial situation. We value communication and will work closely with you to help you achieve your financial and tax goals. Clear communication that makes the most complex financial situations easy to understand. Commitment to providing sound advice and attentive service that prioritizes your interests and ensures the best results for you. Correct, prompt, and affordable service from a friendly, professional, and knowledgeable staff. Consistent, open dialogue to ensure that you remain on the best track to your financial goals. Comfortable and collaborative support that heightens your understanding of your financial situation . Creating competent systems to effectively manage your financial activities.